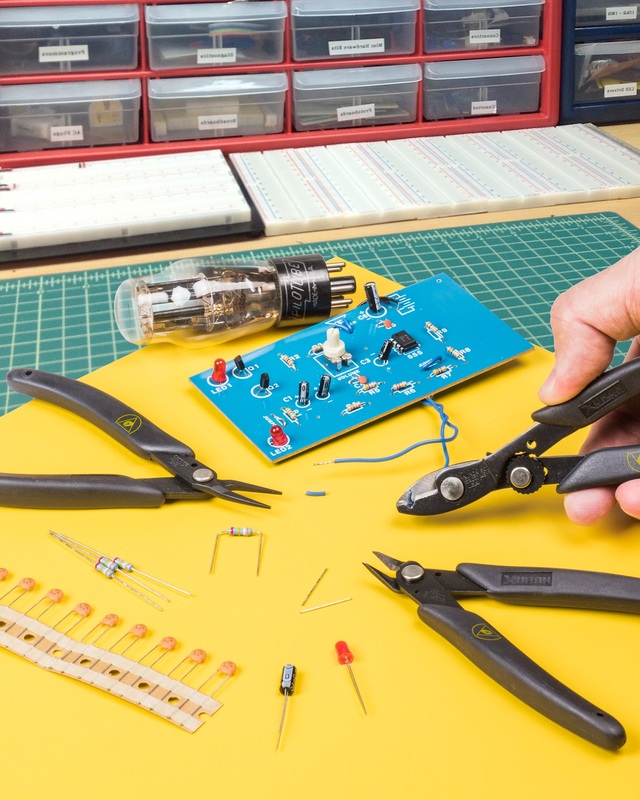 A new, electronics tool kit developed for the hobbyist, ham radio kit builder, and others who want professional-grade ESD safe tools to cut, hold, and strip wire is being introduced by Xuron Corp. of Saco, Maine. The Xuron® TK3500 Home Electronics Tool Kit includes three precise assembly tools with static dissipative hand grips that are designed for user comfort and component protection. Featured are the Model 170-IIAS Micro-Shear® Flush Cutter with a slim profile head for wire up to 18 AWG, Model 450AS Tweezer-nose plier for grasping fine wire under 1 mil thick, and the Model 501AS adjustable wire stripper for 10-26 AWG stranded and solid wire. Designed to fit comfortably in any size hand, the three tools in the Xuron® TK3500 Home Electronics Tool Kit feature static-safe hand grips that exhibit 106-109 ohms surface resistivity and have eye-friendly black surfaces. The flush cutter leaves a flat end on cut wire and a return spring opens the tool after each cut. All tools are stored in a handy tri-fold canvas pouch. The Xuron® TK3500 Home Electronics Tool Kit is priced at $59.95 (list).